Netflix And Chill With New Sourpuss Knits! It’s time for that wacky spring weather again! Expecting all the random snow storms, rainy days, and cool spring days and nights over the next few months. Sometimes it’s just better to stay in! Stay warm and cozy with our new Sourpuss Knit Leggings and Hoodies! Cat ladies, you most definitely need our new Cat Lady Knit Hoodie! This fair isle style hoodie features cute cat faces, kitty paws and “Cat Lady” banner that’s sure to let everyone know where your loyalty lies! Complete with pockets, hood and pom poms pulls for your cat to play with of course! And surely if you buy the hoodie, you’ll just have to get the matching Cat Lady Knit Leggings to go with it! These soft, 100% cotton leggings mirror that same kitty cat fair isle design and is sure to keep you warm and cozy! Let’s face it, some days you just don’t give a f*ck! And for those days, say how you really feel with our Eat Sh*t Knit Hoodie! That same fair isle design you love complete with an ‘Eat Sh*t’ banner adorned with skulls, middle fingers and even emoji poos for added cheekiness! And of course you need the matching Eat Sh*t Leggings to complete the look in profane style! The perfect outfit for those Nexflix and chill days and nights! How can you resist this pattern?! You can find these comfy cozy knits online now, available in S-3XL! Don’t forget to tag us, #sourpussclothing! There’s nothing that brings joy to our hearts quite like seeing our peeps sporting their favorite Sourpuss pieces on our social media pages! Our friend @kawaii_as_ari makes the cutest Sourpuss outfits and has some serious style! Get the look for a style that is so cute it’s spooky! Our So Cute It’s Spooky Shift Dress is perfect for those springtime strolls in the cemetery! This sleeveless shift dress totally gives us grown up Wednesday Adams vibes with it’s scalloped Peter Pan collar and the cutest border print of cats, bats, and ghosts created by artist Ella Mobbs! And yes, it has pockets too! Would you look at how cute our Creep Heart Knit Scarf and Hat are?! Featuring black and white stripes, these monochromatic accessories will go with just about anything not to mention keep you warm and cozy during those cool spring nights! And would you look at that cute black cat?! If you like this look, we’ve got plenty of cute ‘n spooky goodness to add to your home and wardrobe. Our So Cute It’s Spooky Leggings are the perfect transitional piece for spring! They look great with tunics, dresses or skirts and features the most adorable, yet spooky print around. We love that glamorous shiny sheen too! Get ready to Nexflix and chill on those cool, rainy days with our So Cute It’s Spooky Blanket! This ultra soft fleece features that ultra cute spooky creature pattern we love so much! And yes, we’ve added these little darlings to our famous Creep Heart Pillows too, take your pick of cat, bat or ghost! We still even have some of our So Cute It’s Spooky Cadet Dresses left! Don’t miss out on this lovely mandarin collar, cutout dress with the most adorable print around. All at a special closeout price too! Show us what you put together with our collection and tag us #sourpussclothing! All items available online now, get that sweet ‘n spooky kawaii look today! Don’t Forget To Take A Jacket! Spring is here and you know what that means, totally unpredictable weather! It can be be cold and dreary one moment and warm and sunny the next. We’ve got the jackets you need to protect you from the elements in style! Take our Undead Bomber Jacket for example, this satiny soft, embroidered Sol Rac vamp piece is truly a unique work of art! Our new Furry Leopard Bomber Jacket is a pinup’s dream! Not only is it covered in ultra soft faux fur, the inside is lined with luxurious pink quilted lining with pink snap buttons and pink embroidered “Meow” on front! We pretty much need this right meow! Gotta love the style and functionality! The Studded Eisenhower Jacket is totally giving us the most amazing bad girl vibes! This jacket is made from a heavy duty black denim that’s sure to keep you warm on those cool spring evenings. And you’ll love the rock ‘n roll style of black studs throughout! Makes a great canvas for you pins and patches too! Have you tried our best selling Moto Jackets yet?! What’s there not to love? This cropped jacket features an asymmetrical collar, epaulets, and looks great with everything from your favorite pencil skirt to dresses and jeans! Available in classic black, leopard print or blk/wht stripes! If you’re looking for ultimate coziness and comfort, look no further than our Varsity Jackets! These thick jackets are made out of the softest fleece, zip in front, and have big comfy welt pockets! Think of a thick hoodie, but with more style! Available in our Monster Mortuary or Hell designs, snag these before they’re gone! Fellas, our very popular Kustom Kreeps Jacket is officially back in stock and ready for wear! Made from a heavyweight black denim this moto style jacket is sturdy enough for all your pins and patches. Even looks great on it’s own! A classic staple for any man’s wardrobe! Time to take mom’s advice and take a jacket with you, you never know how the weather will be! You can find these, along with our amazing outerwear and cardigan collections online now! Tag us too, #sourpussclothing & #kustomkreeps! We love a good cardigan around here! And our new spring cropped cardigans are no exception! Wow, doesn’t @entrantressity looks stunning in our Death Moth Cropped Cardigan and Black Circle Skirt?! Our Creep Heart Cardigan is absolutely adorable! Embroidered cat-bats from artist Ella Mobbs and pink fabric covered buttons make this cardigan pop! This sweet and subtle little number pairs great with our entire Creep Heart collection or on it’s own! Isn’t @miss__blue looking fab in this cardi? And check out our Backseat Baby Sputnik Purse in blue to match! Celebrate spring color and blooms with our 3/4 Sleeve Pointelle Cardigan in Lavender! The stylized pointelle stitching and white pearl buttons add a dainty touch and will look great with all your spring dresses for a look that’s anything but basic! We’ve totally fallen in love with the Death Moth Cropped Cardigan! How can one resist the pink embroidered death moths and knit bow design? The black/cream contrasting colors and buttons make for one unique look! What a cute outfit from our friends @razorsedge, also featuring our Keep Off Mini Bowler! And speaking of nature’s creepy crawlies, our Spiderweb Cardigan is great for all the spooky babes and spider lovers out there! With embroidered spiderwebs one each shoulder, white pearl buttons, and lace trim it’s the perfect spring cardigan for any woman of darkness! Isn’t this unconventional, retro inspired ode to Spiderman look from @ashleyromantic simply lovely?! Check out the vintage sci-fi vibes of our X-Ray Cropped Cardigan! You’ll love the embroidered hypnotic specs designed by Patt Whelan complete with contrasting pearl buttons. This beauty adds truly unique style to spruce up any outfit! All cardigans are also the perfect 3/4 sleeve length for the season to keep you warm on those cool spring evenings without being too heavy. Show us your outfit creations on IG using the hashtag #sourpussclothing! All cardis available online now! Sourpuss Parasols- We’ve Got You Covered! Beat the heat and stay cool in the shade with our fabulous Sourpuss Parasols! We’ve got 4 great new styles of parasols fall in love with this season! 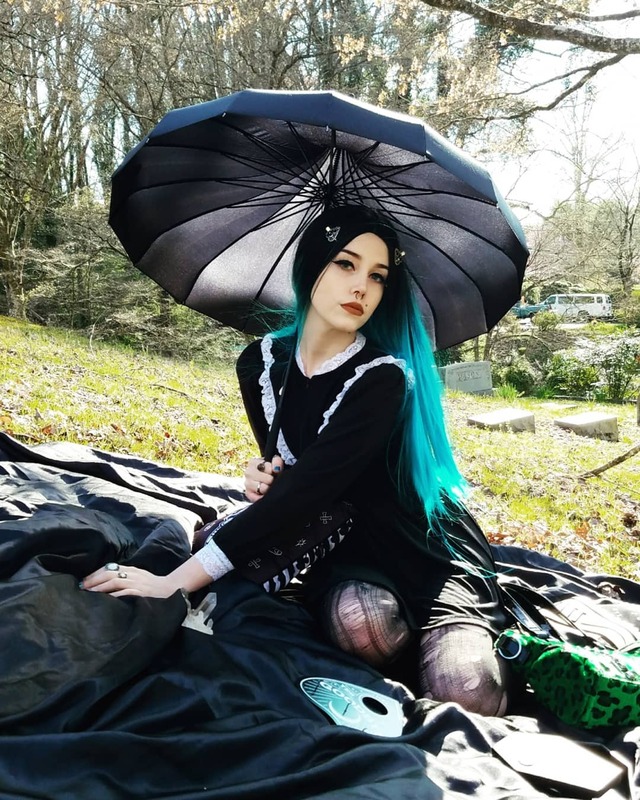 The Spiderweb Parasol is perfect for any lady of darkness and keeps that pale skin looking divine! The Zombie Drinks Parasol is the right amount of creepy and cool for an afternoon of day drinking! Take the Kustom Kutie Parasol out to all the summer car shows and be the ultimate hot rod babe. Stay in the shade this summer while walking the boardwalk or hitting the beach with our appropriately designed Tattooed Divers Parasol. Constructed of non-oiled paper and a sturdy wooden handle, these parasols are durable and built to last. Whether you want to shield your skin or add the right touch of vintage flair, we’ve got your covered! Just like the beautiful @hollyvonmerlot, doesn’t she look great?! 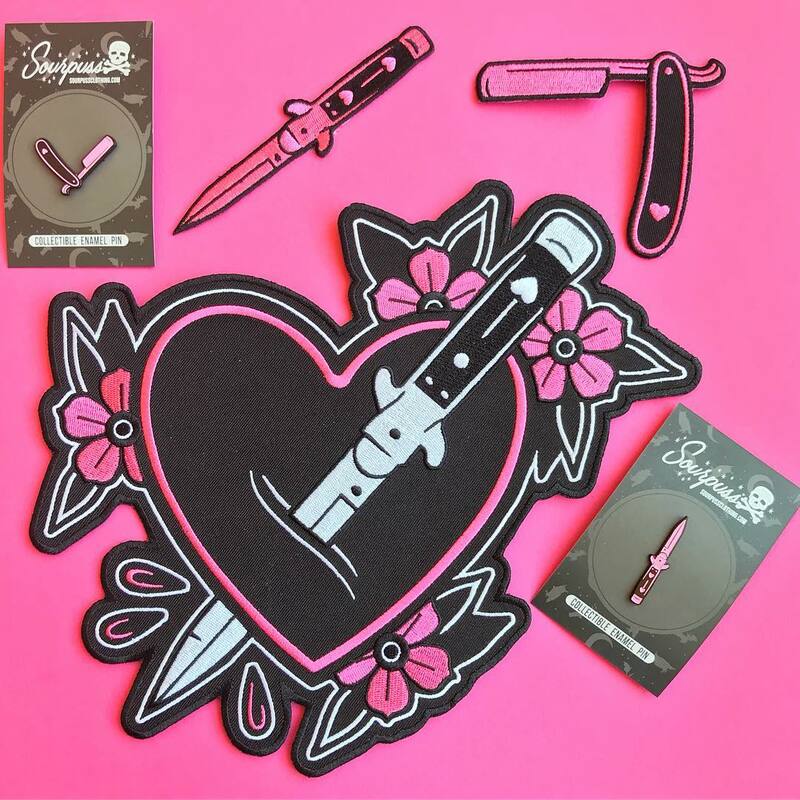 The best part is that we have tons of these amazing prints in coordinating Sourpuss clothing and accessories to complete a matching collection. And with so many designs to choose from, there is truly something for everyone! This photo from @subculturecorsets is pinup perfection! Make sure to stock up on these essential summer parasols here!